How Is Swiss Cheese Made? Swiss cheese is a generic term in North America, Australia and New Zealand that describes cheese with large holes in it. 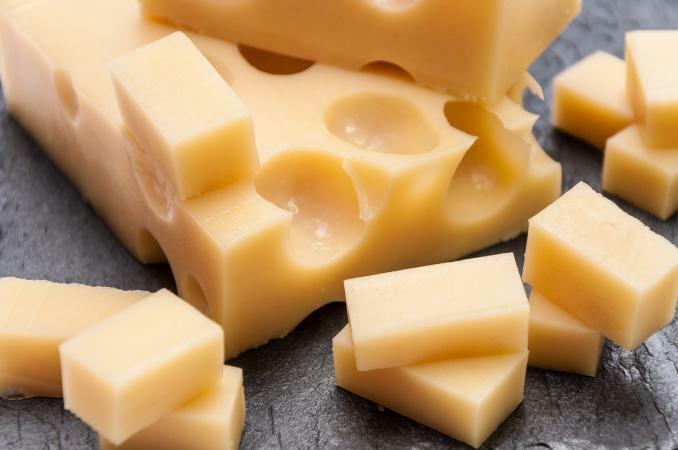 In reality, Swiss cheese can be one of a variety of holey cheeses including Emmental (referred to Swiss cheese in the United States), Jarlsburg, and Gruyere cheeses. There are two methods for making this cheese. The process of making Swiss cheese begins with fresh milk. It takes months from start to finish to have a block of Swiss cheese. Whether you eat Swiss cheese made the old fashioned way or using the modern methods, true Swiss cheese is delicious when served with fruit, crackers, wine, or a simple loaf of bread. The traditional method requires a few old fashioned tools and some additional ingredients beyond milk. Fresh milk is allowed to rest so fat rises to the top. Cheesemakers skim the fat from the top of the milk. Next, they add a starter culture to the milk, which is then heated for 20 minutes over a wood fire. Cheesemakers then add more starter culture and rennet to the milk, which causes coagulation in about 40 minutes. The result is cheese curd. Using a tool, the cheesemaker cuts the solidifying curd and then continues to blend the curd with the liquid (whey) in a large pot called a "harping pot" over the heat in order to separate the water from the cheese. This takes about 30 minutes and results in cheese curds the size of peas. He filters the curd from the whey using cheesecloth. The cheesemaker places the curds in wooden molds and covers them. He presses each mold in the press to remove even more whey and further harden and dry the cheese. It is pressed multiple times before resting overnight in the press. The next morning, the cheesemaker hand-trims the cheese and soaks it for 24 hours in saltwater, which preserves and hardens the cheese. Next, the cheese is resalted and aged in a cellar for at least six months, rotating frequently so it dries and ages evenly. It is during this time the holes make their way into the cheese. The holes in Swiss cheese are a natural byproduct of the above cheesemaking process. They are formed by carbon dioxide pockets that result from the bacteria used to make the cheese. Hole size is serious business in Swiss cheese making. Hole size must meet certain size requirements and there must be a certain number of holes in a preset area. While many artisnal cheesemakers use the above process, larger manufacturers use modern processes that allow them to mass-produce the cheese. The process is similar but has been more automated and is therefore less hands-on. The cheesemaker strains the fat from the milk and puts the defatted milk in a sterile vat preheated to 90 degrees. While the milk is in the vat, an automated process keeps it stirred constantly as the milk heats. When the milk reaches the temperature of the vat (90 degrees), rennet and lactic acid are added and stirring is ceased. The rennet and lactic acid bacteria curdle the milk until it reaches a custard-like texture. A piece of equipment called a harp cuts the mixture into small pieces. This process separates the water (whey) from the curds. Next, the curds are heated to about 125 degrees to assist in the removal of even more whey. The remaining curds are placed in wheel-shaped cheese forms and topped with a lightweight paper. A hydraulic press is used to press the cheese for about 20 hours. The pressure of the press can reach two tons. The forms are placed in large vats of brine, called a brine bath, for 48 hours. During this process, the cheese absorbs salt and releases water. This is also where the cheese rind forms. The cheese is removed from the brine and placed in a cellar. Next, the cheese is moved to a warmer cellar called a fermentation cellar. The temperature in this cellar is between 66 and 75 degrees. Here, the cheese is sweated and turned frequently. Now the cheese is cleaned and moved into a cooler cellar kept at about 53 degrees, where it is matured for several months depending on cheese type. Like the traditional method, the holes appear in the cheese during the aging process. Most important to makers of genuine Swiss cheese is the care of the cattle that provide the milk. The cows graze in the summer on the rich herbs and grasses of the Alps, which gives their milk an herbal quality. The cheese from summer grazing is referred to as Alpine cheese, and has a yellower color than cheese made from winter milk. True old-world Swiss cheese have a flavor that can't be captured using more modern cheesemaking methods. If all you've ever tried are mass-produced Swiss cheese, take a trip to the cheese counter at your local grocery store and ask the cheesemonger for a reputation. Your taste buds will thank you.